Transformers #1 (2019) Gabriel Rodriguez Cover & Angel Hernandez & Ron Joseph Pencils, Brian Ruckley Story In the infinite universe, there exists a planet like no other: Cybertron! Home to the Transformers, and a thriving hub for inter-stellar commerce, it is a world brimming with organic and constructed diversity. Immense structures line its landscape. Mechanical giants roam across its surface. Starship-sized titans orbit its skies, keeping a constant protective watch above and below. Ancient Transformers merge into its very fabric. Small, mysterious creatures skulk in its shadows. It is a truly amazing realm, long untouched by war, and exuberantly reaching for the stars. 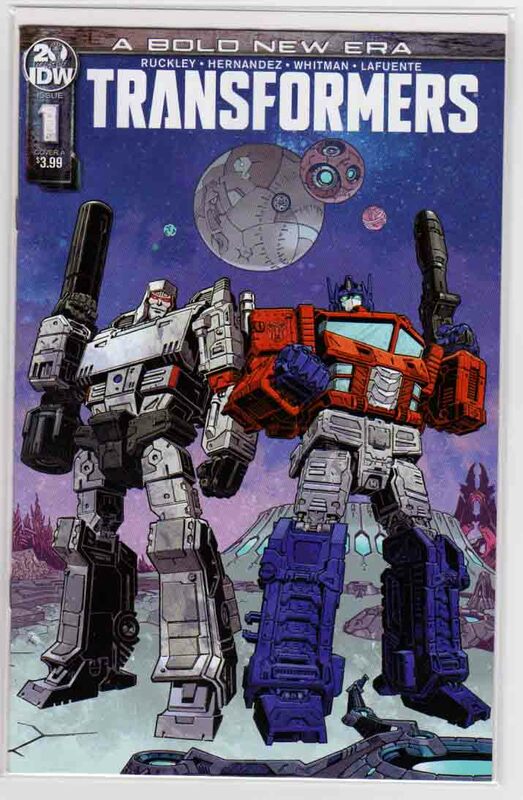 This is the Cybertron that Optimus Prime and Megatron vie for in this bold new origin-a world of seemingly endless peace! All that changes when Bumblebee and Windblade take a newly-forged Cybertronian on his first voyage through this world of wonders-they are confronted by the hard reality of the first murder to have occurred on Cybertron in living memory! All that changes when Bumblebee and Windblade take a newly-forged Cybertronian on his first voyage through this world of wonders-they are confronted by the hard reality of the first murder to have occurred on Cybertron in living memory!